Student Activities puts together a variety of special and cultural events throughout the year. Most activities are free to students, though a current SPC student ID is required for food admission. Events include a Welcome Back Bash, Multicultural Festival, and African American History Month Jubilee. Popcorn and Ping Pong are offered in the UP Lobby every Wednesday. Check out our Facebook page for specific events. The Student Government Association is the liaison between the student body and the college administration. It provides an opportunity for students to participate in college governance. Academic, special interest and religious clubs and organizations are active on SPC's Seminole Campus. The Titan Lounge, located in UP 192 is a comfortable area open to all currently enrolled SPC students for gathering, studying, and relaxing between classes. Students will enjoy charging stations for their electronic devices, as well as, a place for gaming, socializing, and studying. The Titan Lounge is also the place to get your SPC student ID. 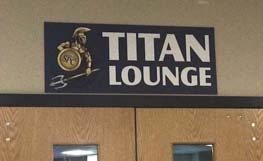 Please note, the Titan Lounge is closed during student events throughout the year, mainly Tuesday/Thursdays from 12:00-2:00 p.m.
Monday 9:30 a.m.- 7:00 p.m.
Tuesday 9:30 a.m.- 5:00 p.m.
Wednesday 9:30 a.m.- 5:00 p.m.
* Call to Confirm Hours prior to arrival @ 727-394-6103. ID cards for students, staff and faculty are made in the Titan Lounge (Location: UP 192). Students enrolled in at least one credit hour at St. Petersburg College can obtain a photo ID card. ID cards are available during regular business hours when classes are in session and during select times in between sessions. Please note: ID hours may change or be limited during certain times of the semester. You may call, 727-394-6103 to confirm ID hours and location prior to arriving. Paid tuition receipt, showing an account balance of $0 or "anticipated aid" awarded. Online students living outside of Pinellas County should visit the following link: Student IDs for Online Students for more information on obtaining an Student ID card. Your SPC ID card can be used to check out books at any SPC, state university or community college library, as well as, for student activity events on campus such as: food and game events and local PSA transit. Your UPC ID card can also be used to check out books at any SPC, state university or community college library. See Niki Johnson (Location: UP 203) to get a SPC Login number and Faculty ID request form. You will need to bring a driver’s license and school ID. Take your SPC Login number and completed Photo ID application and Key/Access card request form to UP 192. You will then receive your UPC Photo ID. Bring your Photo ID card back to Niki Johnson (Room: UP 203) to be encoded as Key/Access card. Determine how you would like to receive your photo ID. Choices are on the request form. Faculty can also visit the UPC office during normal working hours, or see their university liaison on site at the UPC Seminole Campus site for further questions. Be sure to check the bulletin boards on your way to classes, as most student activities are posted there. All notices must be approved by Student Activities, which will review and post approved college related materials on designated bulletin boards on campus. Notices will be posted for up to two weeks.